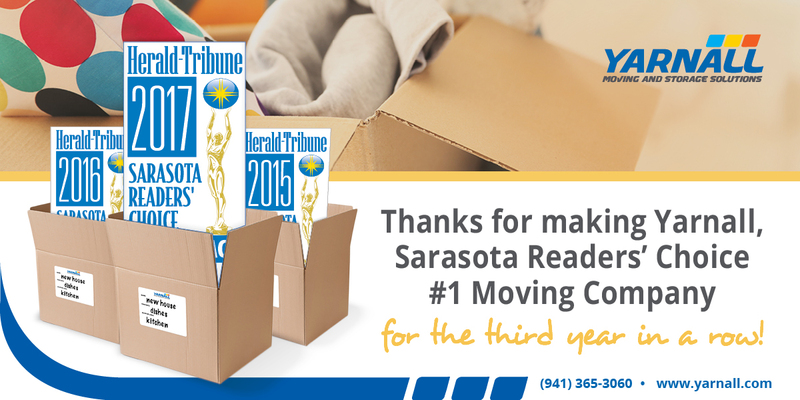 Sarasota Votes Yarnall Number One Moving Company For The Third Year In A Row! The results have come in and once again, the voters have blown us away with their continued support. As you may have read in the Sarasota Herald Tribune, we were nominated by YOU as Sarasota’s #1 moving company for 2017. We are so grateful for the incredible response we have received as we have been voted Sarasota’s number one moving company for the third year in a row! We have proudly been serving the Sarasota/Manatee community for over 100 years, and we cannot thank you enough for participating in the voting process and showing your appreciation for our service. Thanks to the constant feedback from customers like you, we have managed to continuously improve our business until the point that we are at now. We are honored to be a part of such a unique, caring community. Again, thank you for voting for us.